Here in Southern Arizona’s Congressional District 2 we are used to politicians lying about the border and demonizing immigrants to justify anti-immigrant policies, increased surveillance, and wasted money on projects that never really work out. If you are following Representative McSally’s Senate aspirations, you have observed her hard right turn (like her change of position on DACA)–using lies and exaggeration to prove to primary voters that she can be just as hateful towards immigrants as Kelli Ward and Joe Arpaio. Her statement on May 22 to the Homeland Security Committee is a a clear example of how she has abandoned caution and human decency to demonize immigrants in an attempt to justify a hard-line against immigration from the south. In our continued series of fact checking her statements we analyze her claims and distinguish some of the sketchy sources of those claims. Spoiler Alert: she is using terminology and statistics that have origins in known anti-immigrant hate groups. Be sure to read to the bottom where we outline the tactics she uses to manipulate facts and obscure the truth to fit her anti-immigrant agenda. Facts: Pueblo Sin Fronteras is an advocacy group. They provide humanitarian aid and travel with groups of immigrants in solidarity and to offer protection to immigrants, many of whom are making the decision to leave their country due to political turmoil, gang violence, and poverty. They have made this trip with asylum seekers for the past 15 years! Representative McSally ridiculously characterizes this group as “extremist.” This exaggeration would be silly, except it is an explicit attempt by McSally to generate fear. This administration also has systematically targeted other humanitarian aid groups, and so this language used by McSally is even more disturbing and belies an intentional attempt to stoke mistrust in groups engaged in humanitarian efforts. McSally’s Claim: The caravan began in Tapachula on the Mexico-Guatemala border, with the express purpose of traveling to the United States and entering our country – be it by illegal entry or utilizing loopholes in our immigration laws. The U.S. cannot broadly deny asylum claims. If deemed credible, they must be allowed to go through an asylum process. This process includes an application and fingerprinting/background/security checks. McSally is trying to make us think that asylum laws and protections are equivalent to “illegal entry” and that is a lie. McSally’s Claims: Our asylum process is broken, rife with fraudulent claims. Individuals who arrive at our border have no need to dodge our border security efforts because our policies make it all too easy…. Facts: McSally’s terminology changes, in a clear attempt to use fear: from “migrants” in the earlier paragraph, now “individuals,” and “aliens.” Asylum is a legal immigration process, but she needs to delegitimize it, so she calls it “broken, rife with fraudulent claims.” This is an incredible, unsupported claim, as summarized by this Government Accountability Office report. Representative McSally also incorrectly describes the “credible fear” process attempting to make it seem much easier to prove than it actually is. An immigrant presenting at the U.S. border who has a “credible fear” of prosecution if they return to their home country is not just “released” into the U.S. They are first referred to a credible-fear interview by an asylum officer. In 2017 the Trump Administration made changes to the guidelines for these officers, making it harder to seek asylum. If the officer determines the person has a “significant possibility” for establishing an asylum claim, then the process is handled by US Citizenship and Immigration Services (USCIS). A judge then determines if the seeker meets the guidelines. Then there is her claim that asylum seekers are “released into the country 90% of the time regardless of the merit of such claims.” As stated above, immigrants must pass the credible fear interview, so merit is initially assessed, and then further assessed through the USCIS process. Her statement regarding merit is false. U.S. law protects and provides for the protection of asylum seekers. It is illegal to turn away asylum seekers without fairly assessing their claims. Where did the 90% figure come from? We searched “90% of credible fear claims are granted” and found that three of the top five results were from FAIR (Federation for American Immigration Reform) and CIS (Center for Immigration Studies). Both groups have been declared anti-immigrant hate groups by the Southern Poverty Law Center. You can read more about FAIR here and CIS here. The results from FAIR and CIS seem to reference each other and did not reference their data with footnotes for each data point. We reviewed the references and did not locate the statement “90% of credible fear claims are granted.” We did find a link to the USCIS “Credible and Reasonable Fear Workload Summary.” You can find these tables for 2016, 2017, and 2018. We did find that Andrew R. Arthur, Resident Fellow in Law and Policy Center for Immigration Studies, provided testimony to the Subcommittee on National Security United States House of Representatives Committee on Oversight and Government Reform. In his testimony Arthur cites the 90% as the average for credible fear assessed as “present” after an interview. He goes on to say that, well, if you include “closings” where a credible fear claim was withdrawn or some other action was taken, this number drops to 75%. This number, never appears in McSally’s testimony. She cherry-picks the “90%” percentage from the CIS testimony and doesn’t provide other information like that pesky 75% number. Facts: Asylum is a legally guaranteed process in the U.S.. The number of cases and processing time does not magically remove the legal protections for those applying for asylum. McSally selects the favored explanations of anti-immigrant groups like FAIR/CIS, instead of acknowledging some of the other explanations for the increase in asylum cases. Another plausible explanation for the increase in asylum cases is that violence in the Northern Triangle of Central America (Hondura, Guatemala, El Salvador.) This unrest and violence is causing more people to flee and seek safety. These three countries have some of the highest rates of violence in the world. This violence is due to the war, violence, insecurity and political corruption the U.S. helped create in this region over the last 40 years. “The assessment that not applying for asylum is an indication of fraud is ‘absolutely not true,’ said Harris. McSally’s claim: In order to ensure we maximize our ability to accommodate those seeking to flee persecution we must combat this fraud in order to help those who actually have a legitimate asylum claim who are getting lost in the sea of fraudulent ones. ..
Facts: Now McSally wants you to believe she intends to fix the system to help children, but what she really wants to do is severly restrict legal immigration and roll-back the laws that protect vulnerable groups like asylum seekers and children. McSally is trying to claim that protections afforded to children from Central America compared to children from Mexico creates an incentive to “use” children, but this claim is not backed up by data from DHS. Data from DHS indicates that in all apprehension cases at the Southern Border in 2017, only 0.015% (thats 46 out of 303,000 cases) involved the false claim of a parent-child relationship. 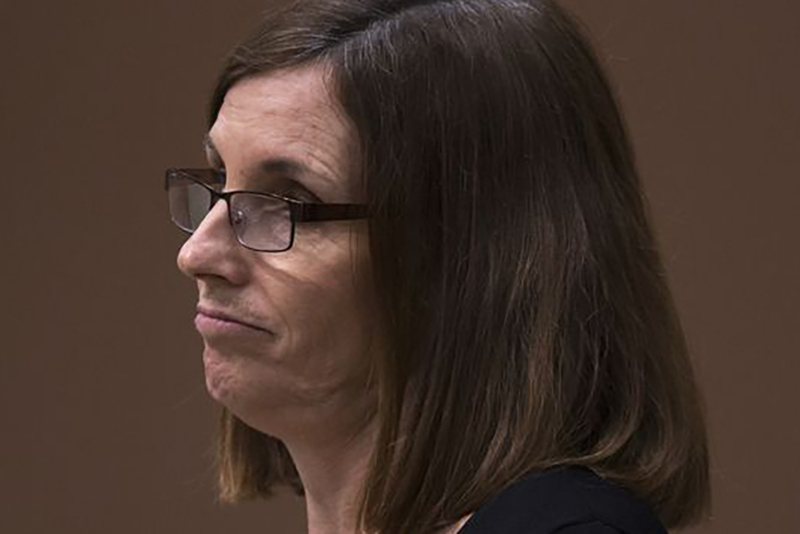 McSally wants to limit protections for children. The Trafficking Victims Protection Act (TVPRA) was passed with bipartisan support and reauthorized in 2013. This act outlines the legal procedures for unaccompanied minors from both contiguous and non-contiguous countries, protecting children by ensuring children from Central America and Mexico have protected rights. Rolling back the protections offered would create greater risk for children by undermining safety and due process. Without these protections, children would be at greater risk of not receiving adequate screenings, not receiving a hearing to determine their eligibility for relief from removal, not receiving legal representation. Removing the protections that are in place may end up speeding up the removal process and sending children back to violent conditions they fled in the first place. This does not keep children safe, it puts them at risk. Facts: McSally’s proposal puts children in harm’s way but she tries to manipulate us into thinking it doesn’t. The reality is that most children from Central America are fleeing violence, including gang violence. Saying we want to protect young people by sending them back to the gang violence they are fleeing is an absurd argument. The MS-13 language has been utilized by the right-wing anti-immigrant groups to attempt to demonize and make us afraid of immigrants. The history of MS-13 is complicated and the U.S. has played a role in creating the conditions for MS-13 to flourish. We should be honest about our responsibility. Learn more here and here. She mentions MS-13 and quickly starts talking about the cartels. This is also a tactic among anti-immigrant groups. She wants you to think MS-13 (a street gang) and the large cartels are the same type of organization (they aren’t). This is a scare-tactic, and now McSally links unauthorized immigration to enriching the cartels. She has again shifted from talking about the legal immigration process of asylum to unauthorized immigration to gangs and cartels. This switching is not just harmless word salad. It has a purpose. She is purposefully linking legal and unauthorized processes together to make us think we need to restrict the legal immigration policies. Migrants are the victims of cartels and when more enforcement goes into the border, it encourages the cartels to act more violently towards immigrants and charge even more money. Additional punitive immigration policies will strengthen the cartels, not weaken them. There are other solutions to addressing the cartels including focusing on the drug demand in the U.S. as well as access to guns and money. McSally’s Claim: We witnessed a 300 percent increase from April 2017 compared to April 2018 and a 37 percent increase from last month to this month … if we do not address this situation we will be confronted by another generation of DACA-like people in the near future. Facts: Even though she has been talking about asylum and other legal protections, she calls these“loopholes,” and equates them to “illegal border crossing.” These two things are not the same. She is implying that restricting asylum protections will help deter unauthorized crossings. Research seems to show that restricting asylum steers immigrants to more dangerous routes, is more costly, and may increase unauthorized crossings. Why is McSally proposing to restrict legal immigration through asylum which may increase danger to immigrants, be more costly, and worsen the problem she calims she wants to fix? McSally and others frequently cite unauthorized entry as a justification for restrictionist and punitive immigration policies. She offers data on “increased” unauthorized border crossings (again not the same as legal asylum claims, and unauthorized crossings are at an all-time low). She probably got her data from this chart, and if you check the numbers, yes there was an increase from April 2017 to April 2018. But the actual trends over time, the annual totals, show a continued downward trend, unauthorized border crossings are at a historic low. Also unauthorized border crossing continue to represent a small number of unauthorized immigrants–most unauthorized immigrants overstay their visa. The majority of Americans support DACA. Her attempts to scare us by saying “we will be confronted with another generation of DACA-like people,” are particularly dehumanizing. DACA recipients grew up in America, consider themselves American, serve in the military, work, go to school and take care of their families. They took a risk even applying for DACA in the hopes of becoming citizens. This language betrays her true intention, to severely restrict legal immigration. She doesn’t care about protecting children. Facts: These last three paragraphs are a gross combination of pleading to seem humane when proposing inhumane and unjust policies (did you forget she was in the Air Force? ), creating false choice (the alternative she isn’t mentioning is reform for a more humane and efficient immigration system), and playing on fears. The idea that we bring anywhere even close to “everyone that is suffering” to the U.S. is absurd. We permit about one million immigrants (a even smaller number of whom are refugees or asylees) per year–that’s 0.3% of our total population, and 1.5% of the global estimate of 65.6 million displaced people. McSally is mirroring anti-immigration language from Jeff Sessions’ Department of Justice. You know what she is up to–don’t fall for it. She is proposing a bill to severely restrict legal immigration and end essential protections for children, and she is using fear and lies from anti-immigrant hate groups as her justification. Misleading with sketchy statistics: McSally, like most anti-immigrant zealots, tries to use numbers to scare us. She cites numbers without comparison or denominator. She talks about “increases” without telling us what the numbers are (e.g., is a 100% increase just a change from 1 to 2?). Here is the actual data on immigrants in the U.S. today. In 2016, about 44 million immigrants lived in the U.S., 14% of the total population. Most immigrants to the U.S. enter through authorized processes. About 11 million immigrants are estimated to be unauthorized, 3% of the total U.S. population. Immigrants, migrants, their families and communities are just as safe (if not more safe) than communities of people born in the U.S.. Immigrants and migrants contribute to the economy and pay taxes. Misleading about Asylum: Asylum is a legal and protected form of entry to the U.S. The asylum process is difficult. For asylum claims heard in court, 53% are denied. Asylum seekers are a small portion of immigrants in the U.S. In 2015 approximately 1 million immigrants attained Legal Permanent Status (LPR) representing 0.3% of the total U.S. population. Of the one million new LPRs in 2015, asylees who adjusted their status made-up just 0.01% of the total U.S. population. Asylum claims have been increasing since 2008, mostly due to migrants from Central America leaving their countries due to violence, poverty and other factors. McSally intentionally conflates those seeking asylum with those attempting to enter illegally.Language: McSally uses inconsistent language in her statement. She starts using the term “migrants” next “individuals” then “aliens” then “children” and finally “these young people.” This shift in language is purposeful. She is trying to create a single undifferentiated group in your mind so you are more willing accept her cruel proposal to limit the rights of asylees and roll-back protections for children migrants. No sources and sketchy data: McSally has a bad habit of not citing her sources (is that what they teach at Harvard?). We did track down one interesting statistic that is sourced back to the Federation for American Immigration Reform (FAIR) and Center for Immigration Studies (CIS), both designated anti-immigrant hate groups. Conflation: McSally is to quick to alternate between discussing the legal immigration system and unauthorized entry. Asylum is protected under U.S. law and is part of post World War II treaty obligations. It is part of our legal immigration system. The processes in place to protect minor children from Mexico and Central America are also part of current U.S. law. She intentionally describes the legal immigration system as “broken,” doesn’t provide good evidence for her claim, and then pivots to discussing unauthorized entry; she does this on purpose so the audience sees the solution to both “problems” as the same – restrictionist anti-immigrant policies. EDIT: A concurrent fact check was being conducted by Arizona’s only non profit community online newspaper, TucsonSentinel.com regarding asylum claims. You can read it HERE!